Salman Khan’s darling sister Arpita Khan gave the best surprise to her Khandaan on March 30. She and hubby Aayush Sharma had their first child Ahil. 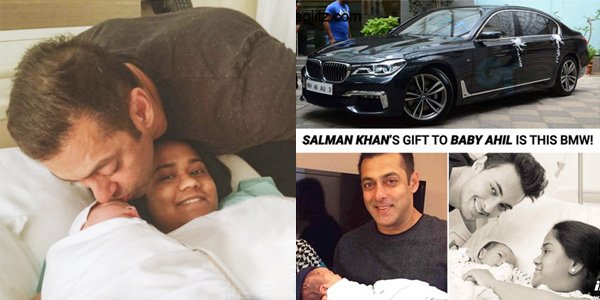 This good new brought a big surprise to Arpita and Aayush as well, because mamu jaan Salman Khan has gifted a swanky car for his infant nephew Ahil. Sources say that, when baby Ahil and proud parents were all set to reach home for the first time from the hospital. Then the car waited outside the hospital to bring them home, so Aayush, Arpita and their bundle of joy Ahil boarded a brand new black BMW 7 series and drove home. This mews came to light when, a fan of superstar Salman Khan posted a picture of the car on Twitter. Arpita married Aayush on November 18, 2014 at Hyderabad’s Falaknuma Palace. It was one big fat Bollywood wedding where all celebs were present.